"I heard the door rattle, and I see you coming in." 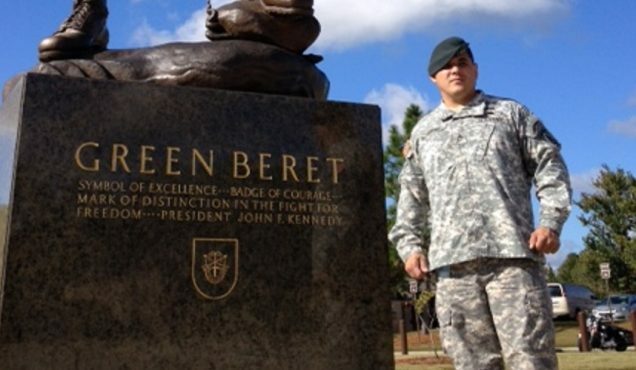 In 2013, Green Beret Sergeant Joe Serna retired from the Army after more than 18 years of service that included three tours of duty in Afghanistan and numerous awards including two Purple Hearts. Returning to North Carolina to be with his wife and children, he found adjusting to civilian life difficult. In 2014, following a DWI arrest, Joe’s case was assigned to the Cumberland County Veterans Treatment Court. After a probation violation, District Court Judge Lou Olivera (above left), an Army veteran who served during the Gulf War, sentenced Joe to a night in jail. Joe was with three other soldiers in Afghanistan in 2008 when their armored truck flipped over and landed in a river. It quickly filled with water and Joe was the only survivor. Knowing Joe’s history and how difficult it would be for him to spend an evening confined, Judge Olivera decided to spend the night with Joe in his jail cell. At StoryCorps, they reflect upon the night they spent together, the difficult memories that being sentenced brought back, and the relationship they have formed since. Originally aired October 14, 2016, on NPR’s Morning Edition. Above photo courtesy of Joe Serna. JS: In Afghanistan, it was me and three other guys on the truck, really good friends, and I had an accident where our truck flipped all the way over into a river, the water came in, and rose from the ankles to my waist, eventually to my chin, and it was pitch black. The only air we had was now filled with diesel fumes. My partner said, “I can’t feel my lips, I can’t feel my arms.” Then I heard him gasping. And I was the only survivor. So I would have relived it over and over and over again in this cell by myself. It was confined space, no windows, and the door was solid, and there was just a small piece of glass you could see in and out, and that was it. But I heard the door rattle. The jailer opens it up, and I see you coming in. LO: You were sweaty, and you were shaking. You were wound tight. JS: When you walked in, that all went away. And then when they locked the door, I thought to myself, He’s going to spend the night here. I’ve never seen this kind of act from anyone. LO: I knew your history, and I talked to the chief jailer, and I said, “Can you put me in a cell with him?” He was a veteran himself, he looked at me and he goes, “Judge, give me five minutes,” and he made it work. JS: We had a long conversation–a lot of it was about our families–and I felt the compassion. LO: We all mess up, we all fall short—I am sometimes not the best husband, or the best father, or the best judge. JS: Truthfully, that was the first time I ever opened up–to trust another person was a game changer. So thank you for being there for me, it means a lot to have someone in your position that understands. LO: That’s that brotherhood, the military, and I get something out of it too. It helps me think about the things I’ve gone through, the things I’ve seen, my military life. You’re a brother, and I just want you to get back. JS: Well thank you, Judge. LO: You know I love you man. JS: I love you too.